2 Standards are subjective and man-made. But what do we mean by “standards”? 2.1 In July 2002, Yang Mian embarked on creating a series titled “Reflections on the Culture of Standards in China: Standards for Ideal Residential Property Development”. Standards are subjective and man-made. But what do we mean by “standards”? A standard is simultaneously a fixed measure, something deemed proper and acceptable, or a criterion against which all other objects are assessed. A standard is a scientifically precise measure that effects an illusion of unity. A standard also encompasses specific value systems, and a particular level for both measurement and representation. Yet from the perspective of the sociology of art, a standard is something much looser and conceptually mixed. Yang Mian’s oeuvre includes the works titled “Standards for Youth”, “Standard Family” and “Standards for Plumpness and Gracefulness”, a series of paintings completed in the late 1990s. He created “standards” for pop art, drawing from and analysing images from popular culture, consumer culture and public culture. This series of paintings focused on the standards by which people are assessed, and in turn assess themselves. “Standards for Youth” treated standards of appearance; “Standards for Plumpness and Gracefulness” illustrated the standards of weight imposed on the human body; and “Standard Family” dealt with standards dictating human identity and belonging. These works are all studies of social pedigree revealing a deeper and ostensibly hidden layering of standards. Who formulates these standards? Do they have anything to do with financial clout and political power? Yang Mian treats these aesthetic behavioural standards as momentary, temporary and relative, rather than as immutable criteria. The images he produced are subjective selections and reinterpretations, rather than faithful replications of external forms. They are ironic, sceptical and critical takes on standards. Implicit in notions of standard appearances and body shapes are the urges to imitation, with an overriding regulation and control reflecting social and political forces driven by desire and profit. Yang Mian’s paintings might resemble pop art stylistically, but their implicit critique is unveiled through his comments on standards. His “standard” family of three members suggests the one-child nuclear familial unit dictated by national ideology. “Standards” upheld by youth of what is popular or fashionable are devices of the mass media for commercial control and profit. Yet Yang Mian’s art eschews a heavy-handed didactic narrative, relying instead on implied and abstracted conceptualisations. His personal style has broken new ground in Chinese painting. “Standards” are essentially an urban – rather than rural – phenomenon, with cities being the centres of material consumerism. Urban expansion is denoted and signified through construction, and concomitant “standards” are devised that influence and affect people’s lives. Different times and places draw on particularised sets of standards. In the 1950s, Chinese urban construction took Soviet-style architecture as the standard, while the 1980s and 1990s saw the rise of “replicant” piled-up “match-box” buildings with reflective glass and ceramic tile facings. Yang Mian’s interest in cities reflects broader, complex social issues, explored not only through his paintings but also through other new media. The focus of Yang Mian’ s social engagement ranges from standards of personal appearance to those that govern urban construction. He advocates an architecture through which people can find self-expression, Yang Mian being acutely aware of the conflicts and clashes rapid urbanisation in China has brought. The last decade of urbanisation has seen near-wanton city destruction and social reorganisation. Lifestyles and life patterns change all aspects of China – historical memory, customs, the body politic and the politicised body. In July 2002, Yang Mian embarked on creating a series titled “Reflections on the Culture of Standards in China: Standards for Ideal Residential Property Development”. He began by examining architectural standards in several major cities. The first was Chengdu, with which he’ s most familiar. “Made in Chengdu” was a group of scaled down model buildings from more than ten property development projects in Chengdu. They were constructed from iron sheeting and housed in Chengdu Painting Academy, a courtyard mansion built at the end of the Qing Dynasty. At night, candles lit the miniaturised buildings so that they resembled a cluster of urban dwellings viewed telescopically from a great distance. On close examination, the density of this “standard” residential community seemed to forge ideally harmonious relationships between human beings and the natural environment. The work was intentionally imposing. As Yang Mian pointed out, “The construction in our cities fulfils the plans of property developers in conformity with urban planning. But what developers seek are profits and what they market are merely concepts.” By contrasting the historical courtyard house in which his models were placed, Yang Mian used his venue as an ironic underscoring of modern construction “standards” in Chengdu. Such a contrast highlighted contemporary design problems and set audiences thinking about whether the formulators of architectural “standards” have the best interests of humans in mind and whether they even address people’s needs. In 2004, Yang Mian switched his attention to Beijing. “Made in Beijing” is his further take on the “standards” of cities, and is a development from his earlier “Made in Chengdu”. Yang Mian regards Beijing as the most urbanised of Chinese cities, one where the urban landscape is disappearing most rapidly and the greatest number of urban construction projects are underway. The city’s fate arouses the most concerned reactions, and despite the talk little concrete salvage action takes place. The construction of nondescript “standard” architecture is a long-standing urban development problem. In Beijing buildings with little distinctive character are designated “Garden Villa Estates”, “Euro-Style Mansions”, “Urban Rivieras”, “Romanian Gardens”, “Parisian Chateaux” and the like. The terms reflect “standards” generated by hegemonic commercial culture, designed to stimulate and manipulate the desires of consumers. Within China’ s cultural context, the use of such terms reflects a loss of historical sense, and in the wake of such a loss, what culture can serve to sustain a city? Yang Mian’s artwork is a critical response to this question. His installation comprises two sections. 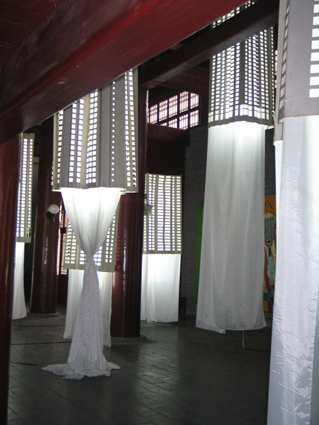 The first, titled “Buildings Flown in from Beijing”, presents wooden models of Beijing’s residential communities shrouded in Chinese rice paper like traditional lanterns in which holes are cut. Eleven models are being hung in the Red Gate Gallery, creating a “mirage” of an urban centre. 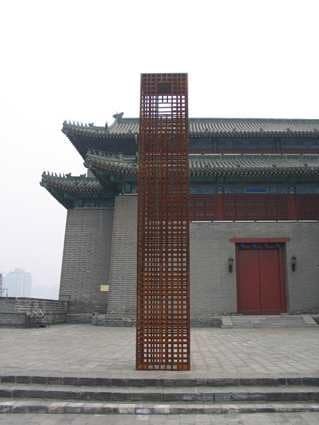 For the second part of this work for Red Gate, Yang Mian has reproduced the landmark architectural “standard” of Beijing. Titled “Beijing Rocket”, this 6 m high scaled replica of the “Mingtai Centre”, the tallest building in Beijing, will be left to rot away over the next five years – in Beijing. The progressive oxidisation and decay of the model over the next half-decade will graphically demonstrate how no “standards” – architectural or otherwise – can remain fixed and unchanging. The work is a metaphor of the uncertainty, constant mutability and illusory nature of standards. This work of art-as-process focuses on what is minimal and concise; the process of production necessarily entails change, not infinity. As Yang Mian points out, “standards constantly change”; they are relative and fleeting in their representation of all hierarchies and order. Yang Mian’s urban “Standards” document two zones of competition and contrast: the competition between cities and cities, and communities and communities; the contrast between Dongbianmen Watchtower dating from the Ming dynasty and the “standard’ buildings of Beijing, and the competition between the traditional and the modern. Yang Mian suspects standards of urban architecture more than many other categories of standards. By contrasting and correlating history and society in different urban cultural contexts, Yang Mian draws the public into an open discussion of urban cultural issues. His work embraces several media – architecture, installation and sculpture, and initiates an open dialogue between an artist and his public. His public becomes THE public in issues of shared concern. Carol Lu tr. ; Bruce Doar ed.